We have a two-day break during our visit to Delhi, and the husband suggests: “Why don't we visit Amritsar?” It turns out to be a great experience. 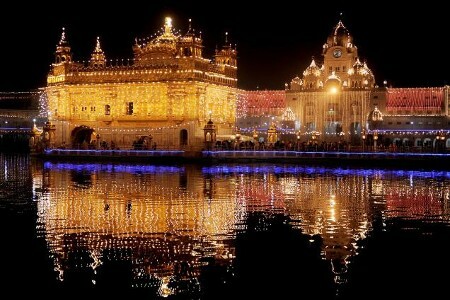 The Sri Harmandar Sahib, popularly known as the Golden Temple, is, of course, what attracts most people to Amritsar. Under the midday sun, the temple dazzles as it stands amidst the waters of the sacred tank, the “Amritsarovar”. Maharaja Ranjit Singh had it adorned with gold-plated copper sheets. Devotees, their heads reverentially covered, wend their way through the bridge that connects the corridor on the banks with the temple. Beneath the ornate canopy lies the revered Adi Grantha Sri Guru Granth SahibJi, the Scripture of Sikhism. The Guru Langar, the community kitchen, is a distinctive feature of Sikh religion. At the huge hall, one can just pick up a clean plate — each plate is washed nine times we are told — and get treated to soft rotis, chole, rice with ghee, and the most aromatic dal. To watch the food being prepared is an attraction on its own. The kitchen has the most efficient equipment for preparing rotis in an assembly-line process. Volunteers are seated at the last point to dab ghee on the rotis and give them the final touch. Think Punjab, and you think of lush fields and food. For even those who are not foodies it is worth a visit to the State just to taste the scrumptious parathas and kulchas spread with desi ghee. Located right in the heart of the Holy city, the Bharavan da Dhaba has now split into two eateries, one of which is the Brothers' Dhaba. Both advertise the unbeatable quality of their offerings. But these are no false claims, we discover as we tuck into the delicacies at Brothers' Dhaba. Our large aloo parathas are served with cups of channa, dal and raitha. They are easily the best we have ever tasted — spiced just right, and with the accompaniments perfectly cooked. Our waiter plies us with spoonfuls of chutney — a delicious mix of tamarind, vinegar and onion. The place is filled with groups of colourfully-dressed Punjabis, and even more colourfully-attired Rajasthani tourists. Punjabi women are easily some of the most vibrant-looking Indians as they are clad in such brightly-hued clothes. We find the shops overflowing with a wonderful variety of materials — phulkari embroidered, printed and plain — teamed with exquisitely-worked dupattas, and reasonably priced as well. The next day, the mood changes drastically as we go back to the times of the Freedom Struggle and the Jallianwala Bagh massacre. Even on entering the narrow lane, a lump comes into the throat as one thinks of General Dyer and his men driving in through the restricted space, and shooting one ruthless round of bullets after another on the helpless gathering of men, women and children, who had come to register their peaceful protest against draconian measures. The Flame of Liberty (Martyrs' Column) is impressive. The sight of the well where the trapped flung themselves to escape the relentless gunfire, and the surrounding walls splattered with marks of bullets, leave a numbing impact on you. The exhibition hall has accounts of the patriots who lost their lives during the Freedom Struggle. A very moving account is of the woman who spent a night in this place of carnage, surrounded by howling dogs and dead bodies, to take her husband's body home for burial. The evening sees us driving off to the Wagah border that separates India and Pakistan, to see the changing of the guard. This has grown into a great tourist attraction. One can see the Pakistanis seated on the other side of the gates. After the exchange of newspapers, the burly BSF personnel and their Pakistani counterparts put up quite a show of flexing their muscles and glowering at each other. The show concludes with the lowering of the flag. Earlier, the crowds exhibit their patriotism, the popular film and patriotic songs played on either side accentuating the effect. Women run relays holding the tricolour and the tamasha seems to energise everyone. Once it is all over the crowds disperse, to wend their way back to daily life — with skirmishes with their neighbours, perhaps, to satisfy their adversarial instincts. On a similar but much smaller scale than the Golden temple is the Durgiana mandir. It is also set amidst a lake and it is pleasant to walk across the bridge. What is a visit to the Punjab without remembering Emperor Ranjit Singh, the “Lion of the Punjab” who scored decisive victories over the Afghans? The Ranjit Singh panorama at the Ram Bagh pays homage to this brave ruler through life-size models that recreate scenes from his court and of the battles fought by him. It was in all a memorable trip. But one that almost never happened, thanks to an airline goof-up. Anyway, we made it and plan to visit Amritsar again, for the taste of the Punjab lingers forever.